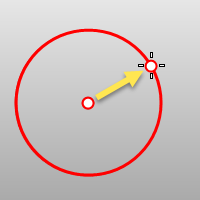 The Circle command draws a circle from a center location and a radius. Pick a radius location or specify an option. Draws a NURBS approximation of the curve will be created with the degree and number of points you specify. Deformable (degree 3) (left); Not deformable (degree 2) (right). Draws the circle from the two ends of its diameter. Pick the start of the diameter. Pick the end of the diameter. Draws a circle through three points on the circumference. Pick three points that define the circumference. 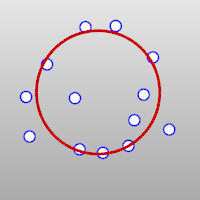 Specifies the radius and orientation for the circle after two points have been picked. Pick a location or type a radius value. Pick a direction to orient the circle. 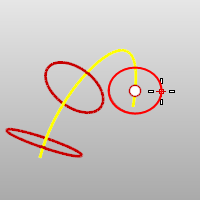 Draws a circle by fitting to selected point objects, curve and surface control points, and mesh vertices. Select point objects or control points. A minimum of three points or control points is required. Draws a circle tangent to curves. Pick the first tangent location on the first curve. Pick the second tangent curve, or type a radius. Pick the third tangent curve, or press Enter to draw the circle from the first and second tangent locations. 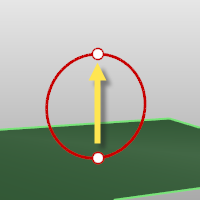 Forces the circle or arc to go through the first picked point on the curve instead of allowing the point to slide along the curve. 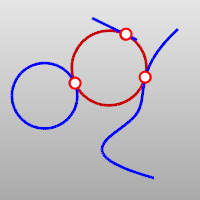 Allows a point that does not have to be a tangent point on a curve. 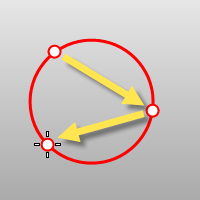 The circle is restricted to the specified radius. 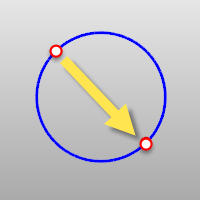 If a tangent point exists on the second curve that meets the radius requirement, the tangent constraint will appear at that point as you drag the circle. Draws a circle perpendicular to the construction plane. Toggles between accepting a radius value and a diameter value. Pick a location or type a value. Specifies an orientation not on the construction plane. Pick a direction that will be perpendicular to the circle plane. 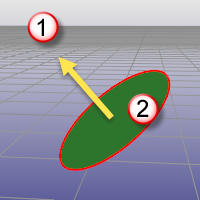 Perpendicular direction (1); Circle plane (2). Type the circumference value at the command line or pick a location to show the circumference length. Type the area value at the command line or pick a location to show the area value.